The WaterSmart Landscape Makeover Series is an educational program that will empower you to upgrade your high-water-use turf area into a WaterSmart landscape. This is done through four classes with lectures, hands-on lab work, demonstrations, homework assignments and one-on-one coaching by local landscape and irrigation professionals, all at no cost to you. The WaterSmart Landscape Makeover Series is a four-class series. Your enrollment means that you've committed to attending all four classes. What you learn each week will build upon the knowledge you've gained the previous week. The big payoff is waiting for you in the last class - an hour of one-on-one coaching with a local landscape professional focused on your project! Find a workshop in your area and get a sneak preview of the series content. These three-hour workshops are free and held countywide. This series of videos will take you step-by-step through the process of creating your very own beautiful, water-efficient landscape. How do you use your space? Do you have kids and pets? Do you like entertaining? Or just want less maintenance? Click on the class title below to view the accompanying slide show. Class 1: Let's Get Started! This class is designed to help you understand the factors needed to create a beautiful and climate appropriate replacement to traditional turf. You will learn the watershed approach to landscaping. 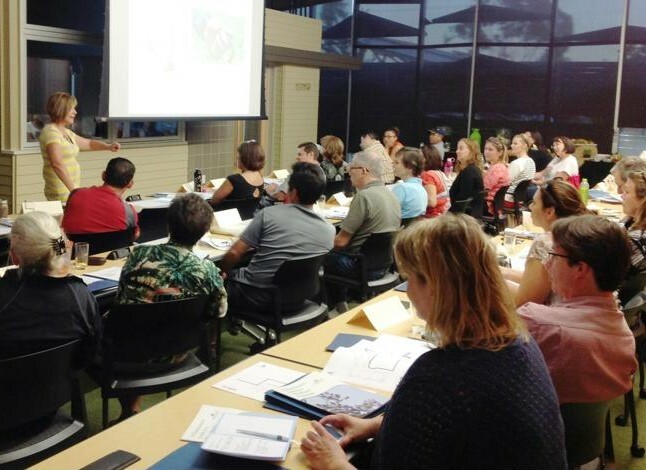 This class walks you through the important tasks of analyzing your site, assessing your soil and consideration for how much water you ultimately want to conserve in your newly landscaped area. The new landscape you envision should support the way you intend to use the space. Imagine creating an extension of your home with consideration for the basic architecture of the house. What type of room would you add? In our Mediterranean climate, you can add an exterior room that may accomplish the same goal. At the end of the day, if a space doesn’t function well for the people who use it, it won’t be successful. Class 3: Make It Happen! This class explains how you will be able to retrofit to an efficient water-saving irrigation system by becoming familiar with the advantages and disadvantages of various irrigation controllers, rotary sprinklers, pop-up spray head sprinklers, sprinkler nozzles, irrigation valves, and drip irrigation types. Proper maintenance and effective watering schedules are also covered. In this session, you’ll be meeting with your Design Coach to finalize your LID, planting, and irrigation plans. If you’re still unsure of what you want to do, don’t worry. Our Design Coaches will work with you to develop the plan you need. Your coaching session will be by appointment. It's FREE and it's EASY so apply today! This program is brought to you by the San Diego County Water Authority and its 24 member agencies, and by grants from the California Department of Water Resources.